Real Madrid head coach Julen Lopetegui says he left Mariano Diaz on the bench in a 1-1 draw at Athletic Bilbao as he felt Gareth Bale needed to be replaced. Mariano was among the substitutes on Saturday at San Mames but remained unused as Madrid fell short of completing a second-half comeback. Isco came off the bench to head home the equaliser but Lopetegui opted not to use Mariano, who returned to Madrid last month after a single season in Ligue 1 with Lyon, becoming the club's sole striker signing following Cristiano Ronaldo's sale to Juventus. Lucas Vazquez and Casemiro were instead used as substitutes by Lopetegui, who explained his choices after Madrid dropped league points for the first time in his reign. "Mariano could have been an option," Lopetegui said at a post-match news conference. "But we thought that Bale needed a replacement on that wing and Lucas has done well. "When there is an international break you have to analyse each player." Luka Modric made way for goalscorer Isco and Lopetegui conceded the midfielder, linked with Inter after winning the Golden Ball for his World Cup performances in Croatia's run to the final, may need time to produce that form again at club level. "Luka has had a complex summer for many reasons," Lopetegui acknowledged. "He has enough time and shows a very good level, and he is back, otherwise we will not put him in. "He is prepared to have a very good season, I have no doubt, despite all the circumstances that have surrounded his summer." With Modric in muted form, Toni Kroos also appeared to struggle at the base of the midfield before Casemiro was introduced to add power to the Madrid core. Kroos, however, delivered the pass that sent Bale clear down the right wing to cross for Isco's goal and Lopetegui defended his use of the Germany international. "It's a position he has already played in Germany and also here," the former Spain coach said of Kroos. "He has done well but it is also true that Athletic have pressed very well during the first half and demanded a lot from us. "With the entry of Casemiro he has taken a step forward in his position and has also had influence on the result for the team." Real Madrid: A season to forget for Isco? 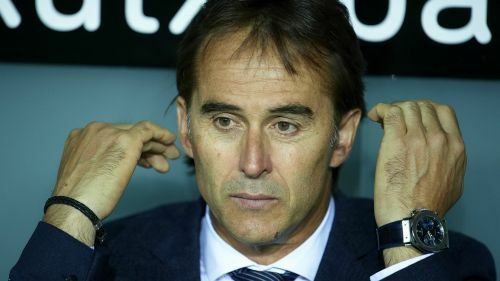 The after effects of Cristiano Ronaldo's departure: Who should Julen Lopetegui sign for the new era?